The Kamehameha Elementary School educational program envisions that our learners will be grounded in Christian and Hawaiian values and will be leaders who contribute to their communities, both locally and globally. As we look to prepare for their future beyond Kamehameha. Educational trendsetters forecast our future will look very different from today. Coupled with living within a global society and the challenges of protecting our precious island resources, our learners will need to draw on ancestral knowledge and their strong identities as they creatively work with others to thrive in todayʻs world. This is the work of E Ola! E Ola! Learner Outcomes is our system-wide curricular framework that emphasizes the development of the whole child. 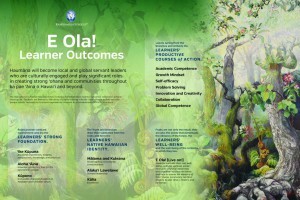 At elementary, we utilize E Ola! as our guiding document as we continue to shift to a learner-centered paradigm. Our teachers are committed to developing dynamic, integrated units of study that infuses Hawaiian and Christian values, 21st century skills (learning, digital, and life skills), socio-emotional learning together with rigorous academics. Students in our lower grades K-4 are paired with teachers to establish a foundation in the core areas of Language Arts, Mathematics, and Social Studies. Haumana can expect a student-centered experience as teachers work to identify and capitalize on their strengths and inherent passions. As students progress to grades 5 and 6, they are grouped into teams where more specialized instruction occurs for English Language Arts and Math. In addition, interdisciplinary units are also a central aspect of their curricula. In addition to receiving the core content with their homeroom teachers, haumana also engage in specialized classes to ensure a well-rounded learning experience. These specialized classes include Physical Education and Health, Science, Performing Arts, Library and Media, Technology, Visual Arts, and STEAM. In addition, in alignment with our commitment to provide a world-class Hawaiian culture-based education, we also offer, ‘Ōlelo a Mo‘omeheu Hawai‘i (Hawaiian Language and Culture) as well as Christian Education. Haumana attend each specialist class about once a week as they journey through Kindergarten to sixth grade.